Bio-Tech's Cleaning supplies and cleaning accessories for all of your detailing needs. We stock premium cleaning supplies including: brushes, micro fiber, chamois, upholstery cleaning products, cleaning brushes, interior cleaning supplies, body brushes, microfiber towels, nylon brushes, scrub brushes, truck brushes, washing brushes, wax applicators, boat washing supply, polishing balls, telescopic brushes, empty spray bottles and flow thru brushes all at competitive and discounted prices. Our waffle pads effectively dissipate heat and reduce the risk of burning your vehicle's finish! loop backing makes it a snap to attach or remove from Velcro backer. Our waffle pads effectively dissipate heat and reduce the risk of burning your vehicle's finish! loop backing makes it a snap to attach or remove from Velcro backer. 3" Mini Foam Buffing Pad /Orange. An everyday pad for average/medium to light oxidation. Wool Pad is a heavy professional pad used for compounding and buffing. Our waffle pads effectively dissipate heat and reduce the risk of burning your vehicle's finish! loop backing makes it a snap to attach or remove from Velcro backer. Wool Pad is a heavy professional pad used for compounding and buffing. Final Finish Black 6" Waffle Foam Pad. Ideal for the ultimate in finish, shine and gloss. 3.5" Mini Foam Buffing Pad-Medium Cutting/Orange. An everyday pad for average/medium to light oxidation. 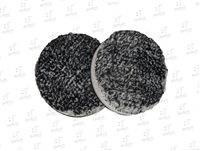 3.5" Mini Foam Buffing Pad Finishing/Black. For new, exotic or expertly restored cars. 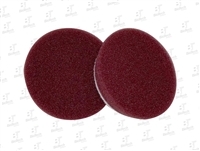 3.5" Wool Blend Pad is a light cutting pad used for final finishing and polishing. 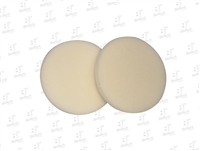 Buffing pad cleaning tool is ideal for removing dried compounds and waxes from wool pads. BigFoot Blue Coarse Microfiber Pads 4"
RUPES BigFoot Yellow Fine Microfiber Pads 4"
Our microfiber buffing and polishing pads have enabled dual action polishers to provide increased cutting ability, making the removal of swirls, scratches and water spots faster and easier An individual microfiber filament is many hundred times smaller than the closest natural fiber, thus giving a pad constructed of microfiber exponentially more surface area. 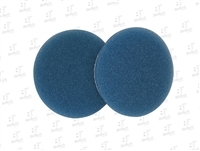 By dramatically increasing the surface area of the polishing fabric material BigFoot Blue Coarse Microfiber Pads maximize the defect removal rate of BigFoot Random Orbital Polishers. These pads feature patented spiral cooling slots to reduce heat build on the paint, and the unique 1-piece molded construction helps to minimize pad delamination from heavy use commonly seen with competitive glued pads. Compared to relative foam polishing pads, RUPES BigFoot Yellow Fine Microfiber pads offer an increased defect removal rate without sacrificing finish quality when used with BigFoot Random Orbital Polishers. These pads feature patented spiral cooling slots to reduce heat build on the paint, and the unique 1-piece molded construction helps to minimize pad delamination common with glued pads offered by competitors. RUPES BigFoot Keramik Fine Polishing Compound is recommended and the combination is ideal for both standard and scratch-resistant paints of all colors where increased cutting is required, but the operator does not want to compromise on finish quality. RUPES BigFoot Blue Coarse Wool Pads 3.5"
While the black and white fibers found in the Buff and Shine Uro-Fiber Pads lead to an overall attractive appearance, they are for so much more than just looks. With both cutting fibers and polishing fibers blended together into one pad, you are now able to remove light to moderate scratches and swirls, polish to perfection, and buff to a high shine in just one pad! Velcro Palm Holder 3" Engineered to reduce drag on the paint, RUPES BigFoot Blue Coarse Wool Pads the ideal choice for maximum paint defect removal when used on BigFoot Random Orbital, Gear-Driven “Mille”, and Triple-Action Polishers. The dual- fibers’ short lengths effectively transfer the orbital movement to the paint for fast cutting, while the blue foam support allows for the pad to conform to body panel shapes and contours. 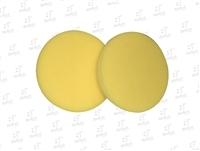 RUPES BigFoot Yellow Medium Wool Pads 3.5"
Microfiber Buffing Pad Dual Action 6"
The natural fibers lightly polish away fine defects and create a high-gloss finish, while the yellow foam support allows for the pad to easily conform to body panel shapes and contours. Unlike traditional wool pads which are known for their tendency to leave finishes hazy the highly refined wool material used in the BigFoot Yellow Medium Wool Pad can leave a wax ready finish after removing moderate defects in just one step. 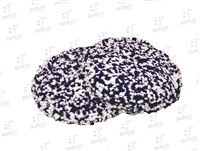 Our Microfiber Buffing Pad Dual Action 6" are made of 100% tufted microfiber technology. They are durable, yet gentle to the touch and quite capable of bringing out the ultimate shine with your dual action polisher. Blue soft polish 8" foam pad with unique "waffle" design. An excellent choice for use with waxes and polishes to produce a deep gloss on any painted surface or color. Black final finish 8" foam pad with unique "waffle" design. Great choice if you are looking for the ultimate in finish, shine and gloss. Yellow light cut 8" foam pad with unique "waffle" design. Rupes Velcro Polishing Foam Pad 100mm (4 Inch)- The unique large cell construction of the Blue Foam pad dissipates heat and allows the compound to maintain its extraordinary cutting ability. RUPES BigFoot Blue Coarse Microfiber Pads 5.75"
RUPES BigFoot Yellow Fine Microfiber Pads 5.75"
Microfiber Buffing Pad High Speed 8"
An individual microfiber filament is many hundred times smaller than the closest natural fiber, thus giving a pad constructed of microfiber exponentially more surface area. 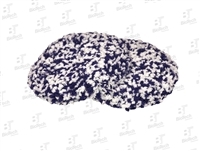 By dramatically increasing the surface area of the polishing fabric material BigFoot Blue Coarse Microfiber Pads maximize the defect removal rate of BigFoot Random Orbital Polishers. These pads feature patented spiral cooling slots to reduce heat build on the paint, and the unique 1-piece molded construction helps to minimize pad delamination from heavy use commonly seen with competitive glued pads. Compared to relative foam polishing pads, RUPES BigFoot Yellow Fine Microfiber pads offer an increased defect removal rate without sacrificing finish quality when used with BigFoot Random Orbital Polishers. These pads feature patented spiral cooling slots to reduce heat build on the paint, and the unique 1-piece molded construction helps to minimize pad delamination common with glued pads offered by competitors. RUPES BigFoot Keramik Fine Polishing Compound is recommended and the combination is ideal for both standard and scratch-resistant paints of all colors where increased cutting is required, but the operator does not want to compromise on finish quality. A durable, but gentle touch that truly brings out any shine. The Microfiber Buffing Pad High Speed 8" utilize the highest quality microfiber to remove swirls, scratches, and holograms quickly and easily. The thick premium pads are able to flex to the curves and contours of any vehicle making the polishing process even easier.